A picture of a previously held Blindfolded conversations event. 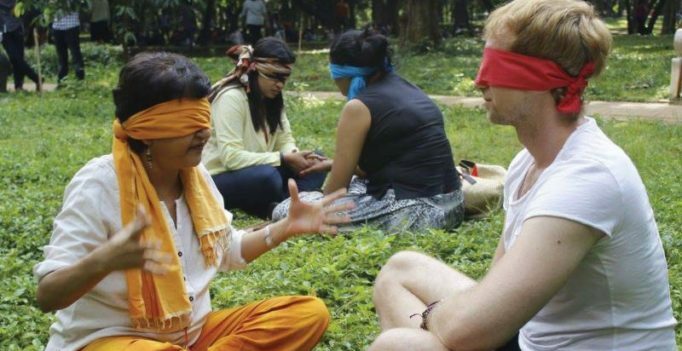 “The participants go beyond the physical judgement stage to discover the person behind the blindfold. Everyone comes with various expectations. Some, to meet someone new. Some, for conversation. Some, out of curiosity. My job is to create something that breaks those expectations and facilitate an experience,” begins Janet Orlene, a therapist and slam poet, who will be facilitating the event. Hoping to milk on the ‘Garden city’ factor of namma ooru, the gig fosters open conversations – under the trees in Cubbon Park on October 14. While parents might love the idea of open conversations, children feel it’s important to have such events on a frequent basis. Speaking of which; 13-year-old Aahan says, “I would love to try something like this as it seems fun. Jolly LLB 3 very much on; will Akshay Kumar or Arshad Warsi be a part of it? Cannes 2017: Schedule and style files of Deepika, Aishwarya and Sonam decoded!